Elio Fox remains in front in the 2018 WSOP Player of the Year race ahead of Paul Volpe and Joe Cada. Elio Fox continues to lead the 2018 WSOP POY race as other bracelet winners move up the standings. 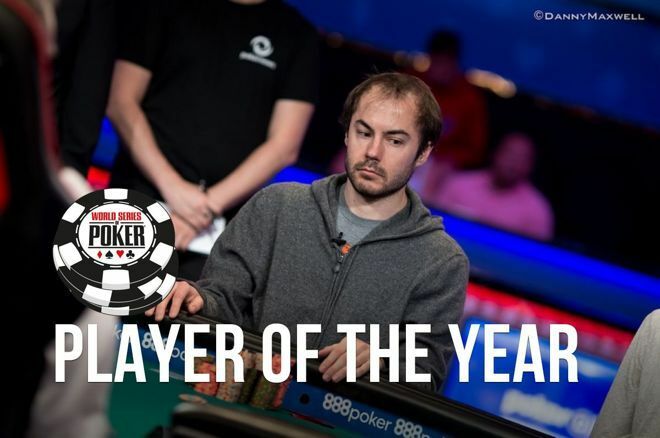 The first week of the 2018 World Series of Poker saw Elio Fox leap into first position in the 2018 WSOP Player of the Year race after notching a win and a runner-up within the first five events of the summer. A second week is in the books at the 2018 WSOP, and while Fox hasn't added any further cashes he remains on top after winning Event #2: $10,000 No-Limit Hold'em Super Turbo Bounty and taking second in Event #5: $100,000 No-Limit Hold'em High Roller. A week ago Paul Volpe had edged into the top 10 after a couple of early cashes. Since then he's picked up two more, including a victory in Event #9: $10,000 Omaha Hi-Lo 8 or Better Championship to earn his third career bracelet and move all of the way up to second in the POY standings. Joe Cada is in third now after winning Event #3: $3,000 No-Limit Hold'em Shootout, one of four cashes so far this summer for the 2009 World Series of Poker Main Event champ. Nick Petrangelo only has one cash so far in the 2018 WSOP, but it was a big one. He won that aforementioned $100,000 No-Limit Hold'em High Roller for a $2.9 million-plus first prize and enough POY points to keep him in fourth currently. Roberly Felicio (in fifth) won Event #7: $565 COLOSSUS No-Limit Hold'em and Craig Varnell (in sixth) picked up the bracelet in Event #19: $565 Pot-Limit Omaha, helping both move up into the top 10. Meanwhile Julien Martini (in seventh) was on the list a week ago after he won Event #4: $1,500 Omaha Hi-Lo 8 or Better. It's no surprise to see Justin Bonomo on this list already (in eighth) after the year he's been having. Adding to his long list of big 2018 scores, Bonomo won Event #16: $10,000 Heads-Up No-Limit Hold'em Championship over the weekend, to pick up his second career bracelet. To round out the top 10, last night Jeremy Wien (in ninth) won Event #20: Big Blind Antes $5,000 No-Limit Hold'em, a day after Ognyan Dimov (in 10th) picked up the title in Event #17: $1,500 No-Limit Hold'em 6-Handed. Meanwhile John Racener (in 11th), Andrey Zhigalov (in 12th), and Benjamin Moon (in 13th) are among those just outside the current top 10. This spring the WSOP announced that after hearing player feedback, the POY formula would be adjusted "to better reward bracelet winners and players who run deep, while still rewarding consistency." The new formula is "loosely based" on the one employed to calculate WSOP Circuit rankings, with modifiers based on buy-ins and field sizes. While we're providing a weekly update on the race here at PokerNews, you can always visit the WSOP Player of the Year page for the latest standings as well as a "Point Calculator" to discover beforehand how points from upcoming events will be awarded according to the number of entries.